Hello Folks. Lloyd Marcus here reporting in from the road with my CCC (Conservative Campaign Committee) team. Ultra-liberal Democrat Congressman Gary Peters who is running for U.S. Senate Michigan is an Obama agenda enforcer. Rest assured, a vote for Peters is a vote for Obama's War on America as founded and continuing the same liberal Democrat policies which have brought down Michigan. I will be polite and not rant about the mess liberal Democrat policies have made of Detroit. Folks, these people, the Democrats, are pathetic. After six years of Obama's failed Murphy's Law presidency, this guy is still out there trying to fire up audiences with his old "Hope and Change" line. The last thing that this unconscionable conman and his minions such as Peters want is real hope and real change. What Obama and company really strives to maintain is their same-old failed destructive Democratic Party policies. Every time a Republican dares to seriously address the issues that have been destroying Michigan for years and seeks to implement common sense solutions, they are vilified; called racist, sexist and so on. You know the drill. Low-info voters believe the lies and vote again for the same Democrats responsible for creating the mess. It truly is sickening. Meanwhile, Obama, the Democrats and Rep. Peters continue to snuggle together riding the huge elephant in Michigan's living room that is causing all the problems; political correctness. So, if you wish to support the continuing decline of Michigan, vote for Obama's homeboy, Gary Peters. His name is spelled P-E-T-E-R-S. 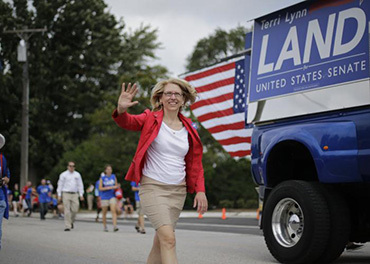 But folks, Republican Terri Lynn Land who is running against Peters for U.S. Senate Michigan remembers. Terri Lynn Land remembers a time when Michigan was first. First in industry. First in innovation. First in creative ideas which prospered America. Terri Lynn remembers that Michigan's strong middle class helped build this country. A dark cloud of policies out of Washington in recent years have made Michigan's glory days a distant memory. Irresponsible spending has residents overtaxed. Absurd regulations choke innovation and investment. Energy restrictions have increased gas and electric costs for Michigan families and businesses. Michigan's middle class was hurt by unfair trade deals. Obama's open border has depressed wages and taken away good-paying jobs. Michigan families need and deserve a senator who will fight to restore Michigan to its rightful place, first. Terri Lynn promises to do just that.